New Delhi -: The blood stains on Zimbabwe's diamonds have started thinning though not by much, many say spurring one of the world's largest-gem and jewelry markets to push for imports of the-stone. "We want rough diamonds," said Sanjay Kothari, vice chairman of India's Gem and Jewellery Export Promotion Council, adding that a $170 million-shipment of Zimbabwe diamonds stranded in Dubai for several months was freed up a few days ago, and that it will reach-India-soon. The council helps source diamonds from overseas and acts as a lobby group for the industry. News that the shipment has been cleared comes--about two weeks after the president of the Kimberley Process a group set up to check the sale of "blood diamonds" said at the end of June that it endorses a decision to allow exports from two mining operations in Zimbabwe's Marange field with immediate effect. The two-operations are Marange Resources, wholly-owned by the Zimbabwe government, and Mbada Diamonds, a joint venture between the Zimbabwe government and South Africa's Grandwell-Holdings. Civil society-groups slammed the decision, saying they walked out of the meeting when it was decided to allow sales, and that the move doesn't address the issue of what they say is continuing-violence in the mining area. Observers say the issue of the Marange fields blew up in late 2008, when the-military allegedly seized control, driving away small-miners and committing human rights violations. Gems--from the field earned the label of "blood diamonds," or precious stones used to fund war and atrocities against people, and were banned from world markets by the 45-member-Kimberley Process in 2009. Reports say the U.S., European representatives and Canada-were-resistant to the idea of opening up sales. Mr. Kothari said the recent meeting of the Kimberley-Process "didn't arrive at a consensus. We will have to continue with dialogue." "We are asking the government of India to intervene so that the issue-between all these countries can get resolved," he added. Traditionally, most diamonds were sourced from companies such as De Beers and Rio Tinto, but the Gem and Jewellery Export Promotion Council, or GJEPC, has been attempting to buy directly from producing--countries in recent years. India-has been trying to reopen and develop domestic mines, but the sources are few, and so it buys billions of dollars of the gem from overseas every year. Almost all of the diamonds are re-exported-after polishing and cutting. India's gem and jewelry-exports jumped 47% to $43.1 billion in the fiscal year ended March 31, 2011, up from $29.4 billion in the previous-year, because of higher prices and demand, according to GJEPC. Mr. Kothari said that it is too early to give any-projections of exports for this fiscal year and whether the consignment from Dubai would make any significant difference. 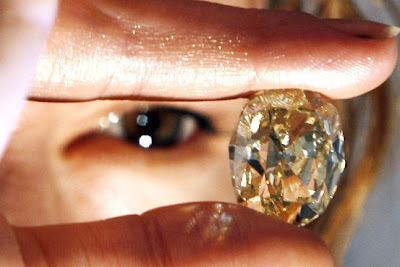 Earlier, industry-officials forecast that India's gem and jewelry exports could rise 15%-20% in 2011-12. The Kimberley Process was established in 2003 to prevent the diamond-mining-industry from funding war. Sailesh-Sangani, a member of GJEPC's board, said that India will benefit-from an opening up of sales at Marange. "India is the largest-manufacturer of cut and polished diamonds, so the country will be the biggest beneficiary," said Mr. Sangani, who is also managing director of export company-Priority Jewels.